We made it, you guys! After 32 long episodes, we’re finally going to find out who will be crowned “Hotel King.” Just kidding. Ciel Hotel isn’t a palace, but a battleground. And instead of a king, a victor will be named. The person who managed to survive the “2014 Ciel Hotel Battle Royale,” will get the privilege of taking over this hot mess of a hotel. Truthfully, the viewers of Hotel King should be the ones who are praised for sticking with this drama throughout its entire run, despite it taking off on the crazy train about 20 episodes ago. Good job, everyone! Now, let’s bid a fond farewell to Hotel King, Jae-wan, Mo-ne, and all of their annoying ways. After Joong-goo’s fatal leap off of the Ciel ski jump, Jae-wan packed up his and Chairwoman Baek’s things and moved into a house by the seaside. Far, far away from Ciel. A year has gone by since Joong-goo’s death, but Jae-wan has neither been back to Ciel nor seen Mo-ne since then. Mo-ne finally tracks him down when one of Korea’s most famous celebrities, Chae Won, demands to have Jae-wan plan her wedding at the hotel. When the two of them finally see other again after an entire year, it’s nothing but awkwardness. 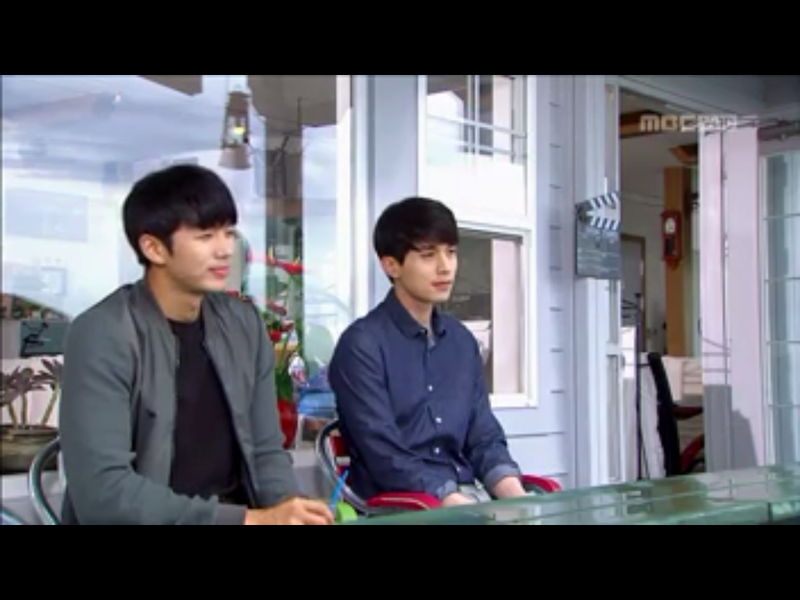 Mo-ne tells Jae-wan that it’s time for him to go back to the hotel and her, but Jae-wan has made up his mind to leave both of those things behind. He can’t return to Ciel because he’s ashamed to be the son of Joong-goo and how actually tried to save him when he jumped off the building, despite all the terrible things he’d done. Mo-ne tries to guilt Jae-wan into coming back, but he stands firm and refuses to go with her. Not only does Jae-wan not want to be back at Ciel, he also doesn’t want to be with Mo-ne anymore. 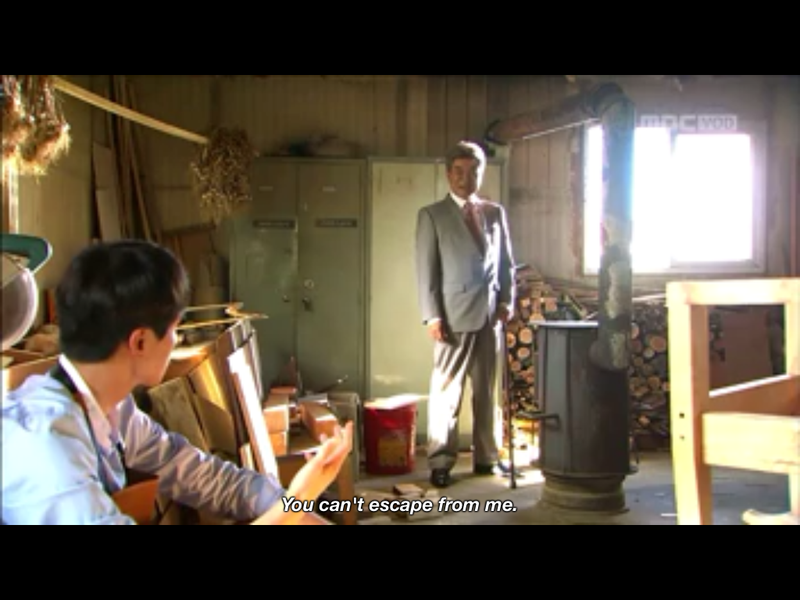 Mo-ne won’t give up on him, but seeing how insistent he is, she gets mad and leaves. Before she goes though, Chairwoman Baek stops her and asks why she’s leaving them again. Mo-ne takes this chance to shame Jae-wan for being a bad boyfriend and son because he’s breaking up with her, and therefore preventing Chairwoman Baek from ever seeing her again. Ugh, like you’re in any position to shame someone, Mo-ne. Before Mo-ne actually leaves to go back to Ciel, she forces/guilts Jae-wan into coming back to the hotel, despite his repeated refusals. She tells him that he has to come back to organize the wedding for Chae Won because he’s “indebted” to her. This relationship is so messed up. When she’s finally gone (thank goodness), Jae-wan has to deal with his mom being mad at him now because she had blindly listened to what Mo-ne told her about Jae-wan being a bad person and not letting them see each other again. When Jae-wan finally gets a moment of peace and quiet to himself, he can’t help but think back to when he tried to save Joong-goo at the top of the skip jump. He also then starts hallucinating Joong-goo standing there telling him that they are forever linked because he is his son, and that he will never be able to escape from him. Man, how does Jae-wan sleep at night with all these thoughts floating around? Back at Ciel, Mo-ne ditches her duties as Chairwoman and instead of planning Chae Won’s wedding, she gets drunk by herself at home. BTW, she’s living at Jae-wan’s old house now, and all of his stuff is still there. Weird. She lives up to her reputation as a terrible, depressed drunk and randomly calls Woo-hyun. He gets there after she threw her engagement ring across the room, and then freaking out about how she can’t find it. Woo-hyun helps her find the ring, and actually stays to listen to her cry and complain about how Jae-wan is so terrible to her, blah blah blah. Woo-hyun might be the only person who can still put up with Mo-ne’s antics. Woo-hyun was apparently so concerned with Mo-ne after her drunkenness last night that he made the trek out to find Jae-wan. He straightforwardly asks Jae-wan when he’s going back to Ciel. The answer is never. But then Woo-hyun not-so-casually mentions how Mo-ne was crying all night because of him, and you know that Jae-wan is so ready to abandon his principles and rush back to her side. What a turn of events…not. At Chae Won’s benefit concert at Ciel, Mo-ne is probably still super hungover, so she manages to wear the exact same dress as Chae Won. Being the haughty celebrity that she is, Chae Won is prepared to make a scene about it, but Mo-ne acts quickly to remedy the situation. She grabs a butter knife to cut her dress’s sleeves, and uses a ribbon from the name cards to make the dress look like a different one from Chae Won’s. Must have been a super cheap dress for it to rip apart in a minute with a butter knife. After Mo-ne’s quick tailoring tricks, Jae-wan surprisingly shows up at the concert to introduce himself as the person in charge of planning Chae Won’s wedding. Hi, I’m your wedding planner. Jae-wan swears that he’s only back at Ciel for the wedding, nothing else. Mo-ne doesn’t buy it and straight-up tells him that she’s going to marry him, and he can’t do anything about it. How the hell is he not scared off by this?! She reminds him that he made a promise to her, and she intends to make him keep it. If I were you, Jae-wan, I’d run as fast as I can out of that damn hotel. While Jae-wan tries to concentrate on wedding planning and not Mo-ne’s insanity, Chairwoman Baek makes things more difficult when she runs away from their seaside home to Mo-ne’s place. When Jae-wan receives the call from his mother that she’s with Mo-ne, he gets there to find Mo-ne pretending to walk down the aisle with her. OMG…this is getting really out of hand. Jae-wan finally got the memo that Mo-ne is batcrap crazy, and tells her to stop. Surprisingly, Mo-ne was able to pause her craziness and desperation long enough to accept their breakup and gives him back the engagement ring. Of course, not before she guilts him for being a terrible person for breaking his promise to her. You’re free, Jae-wan! RUN! The next day at Ciel, they find out that Chae Won’s fiancé couldn’t handle the media gossiping about their relationship anymore and ran away. Apparently, he was staying at Ciel this whole time, and nobody on the hotel staff knew. Keep up the good work, guys. Mo-ne and Jae-wan manage to track the fiancé guy in the hotel parking garage, and Mo-ne immediately starts to yell at the guy for being a bad person and breaking promises. Everything she says to him is actually what she wants to say to Jae-wan. The guy dismisses her, saying that she knows nothing about his relationship. This is when Jae-wan jumps in to speak his mind about how he understands that the fiancé guy is scared and thinks that by leaving Chae Won, he is actually helping her. Basically, Jae-wan and Mo-ne use Chae Won and her fiance’s situation to talk about their own problems. Jae-wan finally admits that he cannot live without Mo-ne, and Mo-ne weeps happy tears and forgives him. And their speeches to each other were so moving that they brought Chae Won and her fiancé back together too. Okay, sure. Listen to our romantic speeches! Jae-wan and Mo-ne get married atop a cliff by the sea, by themselves and with nobody else present. She remains the Chairwoman at Ciel, and he the General Manager, and they have two sons together. Jae-wan’s mother, Baek Mi-yeon, regains her normal mentality again and resumes her position as the Training Manager at Ciel. The Baek family has finally put behind them all the sorrow and revenge plans of the past three decades, and are now working together to make Ciel Hotel the “Heaven” that Jae-wan has always dreamed about. Roman is out of jail! Chae-kyung made an appearance at the Chae Won benefit concert because she was the one who recommended the hotel as a wedding venue for her. She and Mo-ne exchanged greetings and veiled insults at each other. Chae-kyung won, of course. Woo-hyun’s father, Chairman Sun of Woojin Ranch, is determined to set him with a girl, but Woo-hyun is only focused on his work at the hotel. Hopefully, he’s not still hung up on Mo-ne because that ship has long sailed. Glad to have you back, Roman! Hope you enjoyed keeping up with Hotel King with me as the craziness unfolded at Ciel Hotel! Although the show is over, and our characters are looking at nothing but rainbows and sunshine ahead, there’s still more Hotel King to be discussed. Stay tuned for an upcoming series review with my overall thoughts on the drama! Until then, treat yourself to a vaca at your nearby 7-star hotel…but hopefully one a little less eventful than this one. Ciel Hotel: the most dramatic hotel ever.